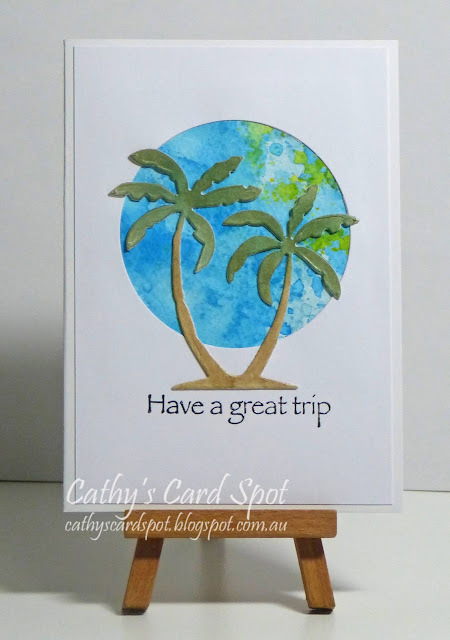 Cathy's Card Spot: Summer Fun with brilliance wax and gelatos! Hi everyone, I wish I was on a tropical island in the sun right now! It's been very cold and windy here lately, although being the middle of Winter it won't be too long before I'll be complaining about the heat lol! I'm playing along with a few challenges. At Simon Says Stamp Monday the theme is Summer fun. At CAS Mix Up Card Challenge the theme is to colour your diecuts. I often colour card or create an inky background then dicut my pieces from that. So instead I diecut the palm trees then rubbed Antique Brilliance wax in lucky emerald on the leaves with my finger, and painted iced chai gelato with a little water onto the stem. The trees have a lovely shimmer in real life. Here's a closer look. My elements are coloured diecuts, diecutting, gelatos, watercolouring and stamping. I created the background using Loll's splash watercolour technique. The link is to a quick video tutorial. It's a lot of fun, although I found blue ink splashes in quite a few random places lol! Hubby wanted me to add a sun, I opted for some yellow and mopped the ink up with a paper towel before it turned green! So I'm also linking to the CAS watercolour challenge where splash watercolouring is the theme. I used a few blues and a yellow distress ink. 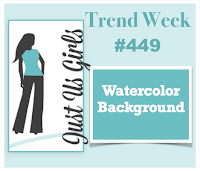 I'm also linking up to Just Us Girls as they have a watercoloured background theme. Palm tree die, unbranded from craft fair; Spellbinders circle die; Prima antique brilliance wax; gelatos; distress inks; Kaisercraft Bon Voyage mini clear stamp; versafine ink & clear ep. What a beautiful card. Love the fabulous splash technique and those shiny palm trees just pop of the card. Clever DH to suggest adding a sun and then to use a little yellow and then mopping it up quickly before it went to green. Fabulous happy card. 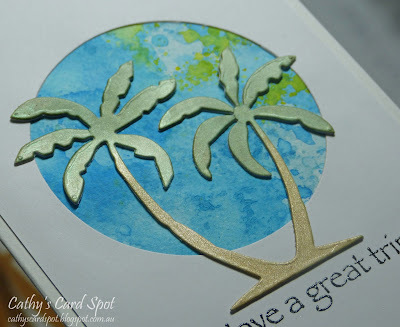 Thank you for joining in the fun challenge at The CAS Mix Up Challenge with your wonderful card x.
Adore your shimmery palm trees and the fabulous splattered background! The palm trees are fabulous, Cathy, and I love the touch of yellow in the wonderful splashed background. Thanks for sharing your card with us at Just Us Girls. A tropical paradise, Cathy! Beautifully colored palm trees and a perfect topical background! Thanks so much for sharing this with us at CAS Mix Up and CAS Watercolour!